The 2013 Sprint Triathlon Hacienda Tres Rios took place last Sunday, May 26, a hot, sunny morning in the Riviera Maya. Over 300 triathletes participated alone or in teams. Participants swam 750 meters in the Caribbean Sea and rivers, then biked 20 kilometers and ran 5 kilometers in the Tres Rios Nature Park. In the Men’s category Carlos Gracida took first place, Jesús Lizama came in second and Sebastián Ordoñez third. In the Women’s category Carly Casarrubias took first place, Brenda Iñigo second and Nelly Becerra third. Mexican Televisa actors Mariana Van Rankin, Lorena Marín, Rubén Branco y Juan Carlos Gascón also participated as a team. The 4th Sprint Triathlon Hacienda Tres Rios will take place in May of 2014! 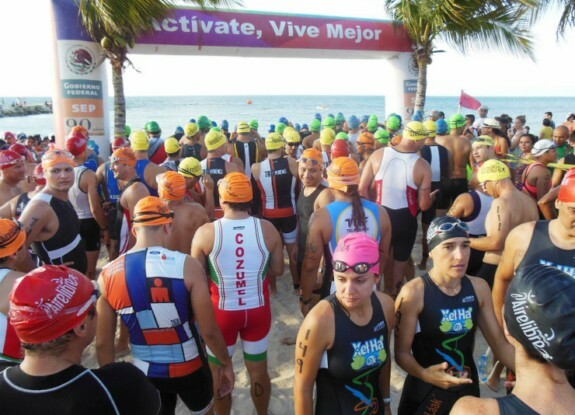 3rd Triathlon Hacienda Tres Rios Riviera Maya – Accept the Challenge! from HaciendaTresRios on Vimeo. Quiero participar enel evento. por favor enviar info de registro.